A successful late-season Douglas Island hunt. Photo by Jim Craig, ADF&G. 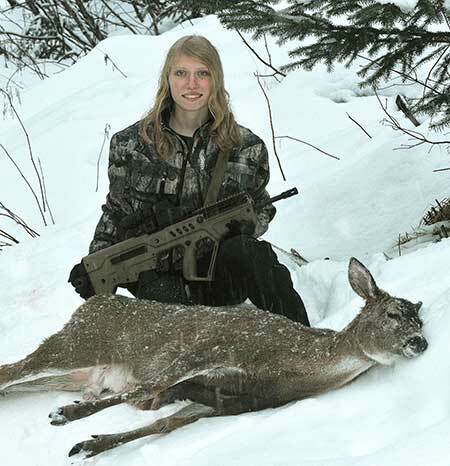 Sitka black-tailed deer season opened Aug. 1 in most of Alaska. There are vast differences in deer numbers across their range in Alaska. Past winters hammered deer in many areas and populations are still recovering, but last winter was relatively mild and survival was good. Fish and Game biologists offer their insights into the areas they manage. Sitka black-tailed deer are found throughout Southeast Alaska and have been introduced to Prince William Sound and Kodiak Island. Southeast is divided into five Game Management Units, managed by area biologists. These state biologists gather information on deer in a variety of ways. A report card associated with each set of harvest tickets is filled out by hunters and returned, and provides insights into hunter success and possible trends. Biologists spend time in the field looking at deer, deer sign and the condition of the habitat. They talk with hunters and others who spend time afield. Deer pellet transects are conducted in the spring in specific watersheds, providing insights into trends. Mortality surveys are done in some areas to asses winterkill. Aerial surveys of the alpine in some places offer clues. In central Southeast, biologists are experimenting with a new mark-recapture technique involving DNA analysis of deer pellets that may help measure abundance and changes in abundance. State wildlife biologist Phil Mooney manages deer (in GMU 4) on the ABC islands, Admiralty, Baranof, Chichagof, areas popular with hunters. Deer numbers plummeted on the islands after the winters of 2006-07 and ’07-’08, when deep snow persisted late into spring. The northern and eastern sides of the islands were particularly hard hit. Deer numbers have improved in recent years. The doe harvest was curtailed on northeast Chichagof in past years due to low numbers, but Mooney said he doesn’t see the need for any hunting restrictions there this fall. “We had very little, if any, winterkill,” he said. Mooney said a deer research project is underway in the Sitka area, and he’s been collaring deer. 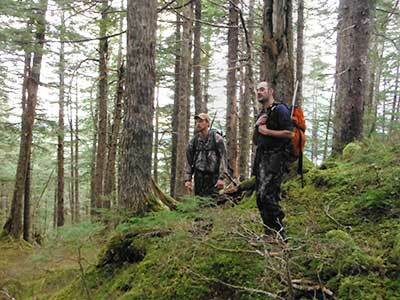 It’s a cooperative venture between the Forest Service, ADF&G, and the Sitka Conservation Society, looking at the use of second growth forest by deer. Researchers are looking at the habitat as well as the deer, and Mooney said he’s targeting 10 deer and some of those will wear GPS-Iridium-linked tracking collars. The device is new and offers a remarkable feature over the store-on-board collars that must be retrieved to download the data. “It dials your phone every two weeks or so and downloads the data,” Mooney said. Past research has offered some good insights into deer, and Mooney mentioned a joint ADF&G and graduate student research project on Prince of Wales Island that provides a sense for how much habitat a Sitka black-tailed deer needs, and what deer densities are in good years in good habitat. Mooney said that work indicates 18 to 22 deer per square mile. That’s about one deer per 22 to 35 acres (there are 640 acres in a square mile). A NFL football field is 160’ x 360’ feet or 1.3 acres. Southeast hunters Hiram Henry and Terry Schwarz ponder their next move. “An area encompassing 22 to 27 football fields is about the area needed to support a deer, and that’s good habitat with forage for winter and summer, with a mix of canopy cover and open areas,” Mooney said. Deer numbers are looking good on Prince of Wales this year. Steve Bethune is a state wildlife biologist based in Craig on Prince of Wales Island. The southern end of POW has lower habitat productivity and consequently lower deer densities. Ketchikan is east of Prince of Wales, and Unit 1A includes the Ketchikan area and the mainland of southern Southeast. Boyd Porter is the state biologist there, and he said the recent mild winters have been good for the local deer in his area. Porter said conversely, in a tough winter, a pregnant doe may reabsorb the small fetus, a physiological strategy that allows her to preserve the otherwise additional energy investment. The doe may also lose one or both fawns to starvation related causes during a hard winter and we did not see much sign this past year of winter fawn loses. He said deer numbers are slowly coming up on Gravina Island, but are still very low on both Gravina Island the Cleveland Peninsula. “We are still looking closely at the Cleveland and Gravina Island to measure changes in deer populations and indications of recovery. For these areas you’ve got these little pockets of deer,” he said. “Even though a few watersheds may be increasing in these two areas, they’re not dispersing and filling in some of the gaps.” Research in Southeast Alaska shows that a Sitka black-tailed deer tends to live its entire life in the area where it was born, usually the specific watershed. 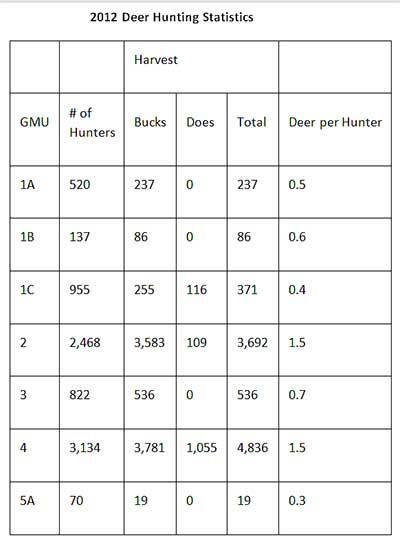 A look at the numbers: Prince of Wales Island (GMU 2) and the ABC Islands (GMU 4) have the most hunters and the highest harvest rates. Biologists are currently working on new monitoring methods to estimate deer densities and to better track changes in deer populations in southern southeast. Deer are found in pockets along the Southeast mainland between the Cleveland Peninsula and the Stikine River. Rich Lowell, based in Petersburg, is the biologist for this area and islands to the west, including Mitkof, Woewodski and Kupreanof Islands. He said numbers are down. There is one bright spot that offers some hope for coming years. “The past winter we had below average snowfall, about 50 percent of normal, which may aid in rebuilding the population,” Lowell said. Moving up the coast to the Juneau area, state wildlife biologist Ryan Scott echoed others’ sentiments about the benefit of the recent mild winter. Consistent with the rest of Southeast Alaska, deer numbers on the northern mainland are lower than the islands to the west. For a lot of Juneau hunters, that’s Douglas Island and Admiralty Island. Scott said deer numbers look good. Also a hunter, Scott was encouraged by what he saw last fall. “We saw more sign last year when we were deer hunting on northern Admiralty than we have in years,” he added. Scott said the habitat is in good shape in northern Southeast. “One positive outcome to having low deer density for a few years is that you give the vegetation time to regenerate,” he said. Historically, Sitka black-tailed deer were not found north and west of Yakutat, that’s the extreme northern limit of their natural range. Deer from the Sitka area were introduced to Kodiak and adjacent islands in the 1920s and ‘30s, and deer were introduced to Prince William Sound and area islands between 1916 and 1923. They tend to do better on the islands (like Hinchinbrook and Hawkins) than on the mainland, because the maritime climate is a bit milder. However, winter mortality can be severe, and it seems that every decade a winter comes along that hammers the population. In the winter of 2011-12, more than 27 feet of snow was recorded in Cordova. 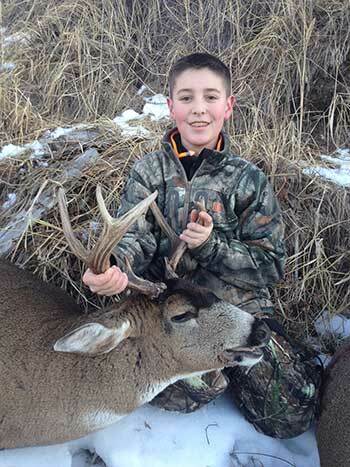 Hunter Ryan Reed with a Kodiak Island deer. Charlotte Westing is the biologist based in Cordova. She manages deer in the Prince William Sound area. Kodiak Island and adjacent Afognak Island were also hard hit by the winter of 2011-12, with an estimated 40 percent mortality, but state biologist Nate Svoboda said deer are coming back. For more information on the deer transplants to Prince William Sound and Kodiak Island, see Game Transplants in Alaska.